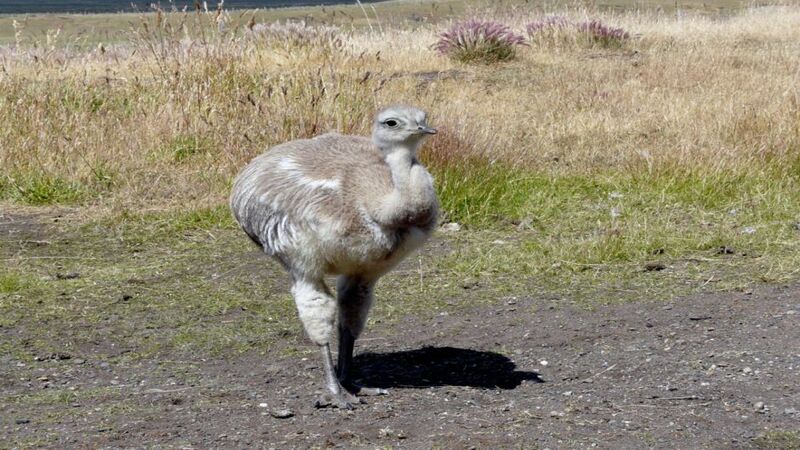 It is also known as Patagonian ostrich, rhea, rhea southern Magallanes rhea, Patagonian rhea, pony Patagonian rhea and ostrich Darwin. R. p. pennata inhabits open areas of shrub steppes in the steppe, at altitudes between sea level and 1200 meters. 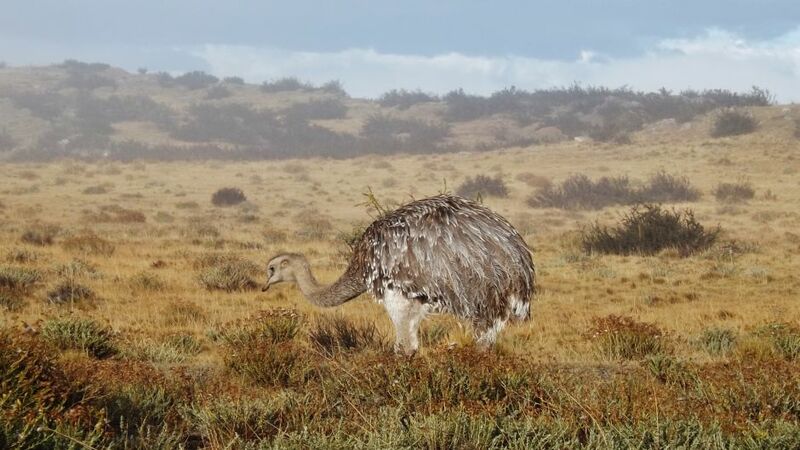 He lives mostly in Argentina Patagonia, in the provinces of the south and southwest: south of Mendoza, all areas extraandinas Black Rio Neuquen, Chubut and Santa Cruz, as well as the west of La Pampa and the south end of Buenos Aires, where the first descriptor found taxon. 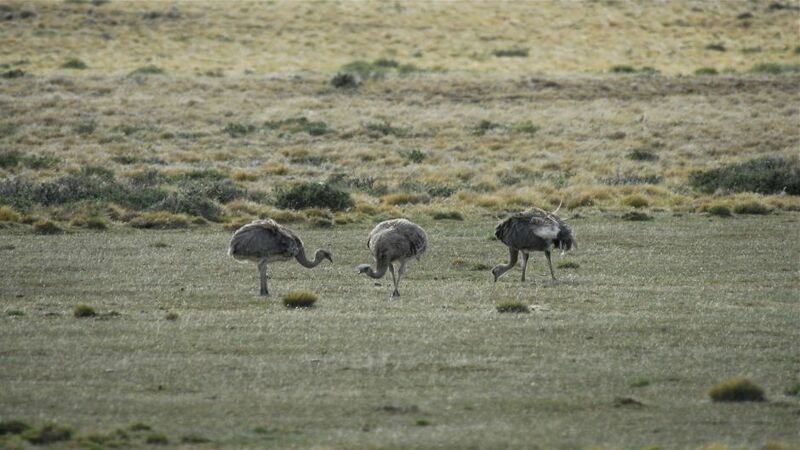 Although it has not again been recorded in the southern sector of the province, he has detected only two records in 1984, in two locations farther north: Juan Cousté (3 adults) and lagoon Chasicó (1 adult). It is suspected to have been a small population introductions fruit ranchers more than a relict population. 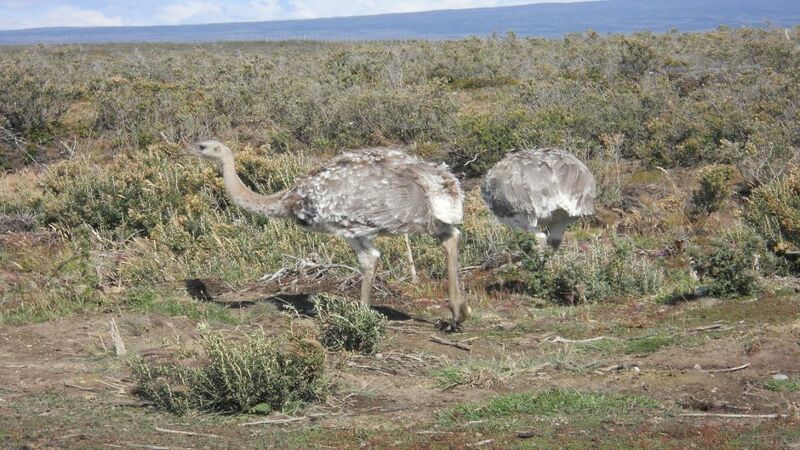 The northern limit of its distribution is not clear, since populations of low-lying areas of La Rioja that had been tentatively assigned to the typical form were reclassified as Rhea pennata garleppi. The taxon may have had an even greater distribution, judging by fragments of shells huevosn. I found at the archaeological site Arroyo Talainín, located in the western sector Salsacate Valley, at 1030 meters above sea level, near the hamlet Cañada de Salas, in the province of Córdoba, dating between 1000-700 AP; although it was not possible to assign to the subspecies A. p. A. pennata or p. garleppi. It is also found in similar environments of the Chilean Patagonia, in the regions of Aysén and Magallanes and Chilean Antarctica. Chiles largest populations are in the region of Magallanes, while in the Aysen these are very small, being present only in two locations: Cochrane & Bath New. Rheidae remains, possibly of this taxon were recorded, in the context of Pleistocene-Holocene transition on the Big island of Tierra del Fuego, at the archaeological site Tres Arroyos (53º23S, 68º47O), on the Chilean side of the island. They were dated at 9960 ± 50 Rev.12 is possible that the taxon is extinct due to hunting of the first Native Americans who inhabited the island. Chilean island in that sector was introduced / reintroduced taxon during the twentieth century. 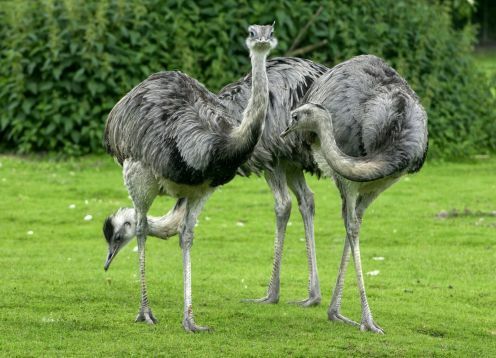 It is a bird of about 90-100 cm in length (measured from the tip of the beak and tail tip), with weights ranging from 15 to 28.6 kg. 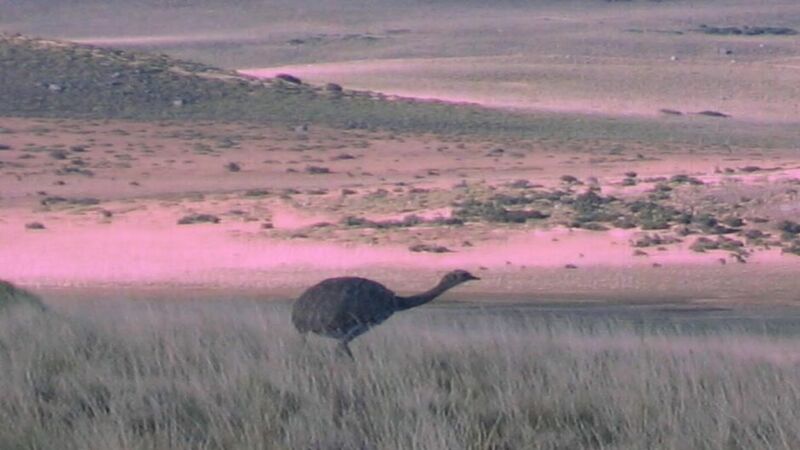 It has a small head, like its peak color brown-horny, measuring between 6.2 to 9.2 cm. 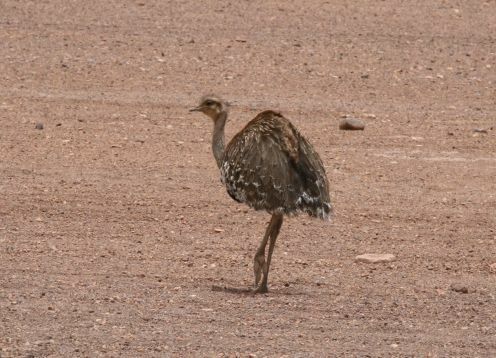 As a counterpart, neck and legs are long, the latter let you race speeds up to 60 km / h. The top of the tarsus is feathered. Its color is brown to gray brown with white mottling. The color is identical in both sexes, but females are slightly smaller. Pups are born with a yellowish white and mottled acquire adults per year; They are sexually mature at 2 years old. Rhea pennata pennata differs from the northern subspecies being slightly larger, have longer legs, and show a more ocher in the higher, with the most notable dotted white. Tarsus has, on its front, 16 to 17 (or 18) horizontal plates, called technically: escutelaciones.